I sucked it up right nice during our first round (scoring a 60). Then Kellie got hungry and Brian bowled for me while I fed her. She finished eating in time for me to bowl the last frame of our second round of bowling. 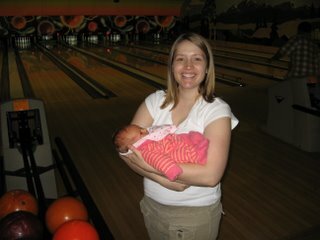 I bowled while holding her and I got my first spare! My kid is good luck...or my holding her tilted me the right way to correct my constantly left-going ball. Either way, we had a blast! Hi! I can't believe you're a mommy! She's so cute! You and Brian are going to be great parents. how fun. I haven't been out with Paul in such a long time. It must be fun to really enjoy your spouses company! Bowling while holding baby, hmm haven't tried that one yet. Glad to hear that it helped your bowling to improve.